How exactly do you set the cam timing? I didn't have to remove anything else to get the top timing cover off, its a little tough, but the plastic flexes enough to push it down and slip it out of the grove. Getting it back in is actually harder, but I can do it pretty quick now. I read somewhere (possibly in the d15z1 swap thread) that you can remove the pulley in the car with it in gear, but it seems like you might have to have that wheel on so the car doesn't fall off a stand or move too much. Like I said before I can't get anything other than maybe the 1.6 liter mark to line up with anything (I think earlier I refered to it as 6 o'clock, but I can tell from your picture that it really isn't) Should I be trying to line it up to time it to the "D" mark? I can figure it out with your instructions if I just know what mark to use to time to. None of my manuals say, and I think you suggested using the 1.5 liter cam marks is supposed to set TDC on the cam? I feel like a dumb ***. You line them up with the joint between the valve cover and the rest of the cylinder head. It's only about half a belt tooth different when compared to the 1.6 liter mark and pointer, but that's enough to prevent you from installing the belt properly. I have never heard of a 1.6 Liter mark. In any case, your problem sounds to me like, most likely, your timing belt is off by one tooth. It is very easy to have it be off that much and not catch it, particularly if the person doing the replacement doesn't check their work, after they have tensioned the belt. Most likely, you just need to reposition the belt. You need to use the 2 marks on the camshaft, the blue lines in the picture, lined up with the bottom of the head. You then need to use TDC on the crankshaft. With both of those lined up you then need to add the timing belt. You need to tension it, like is described. Then, after you have tensioned it, you need to put the Crankshaft to TDC and adjust your distributor so it is pointing to the number 1 spark plug wire. Then connect a jumper wire to the test harness and set the timing using a timing light. Go pick up a manual. Chilton's, Haynes, Honda... It's been in every single D-series manual I've read so far, and on every SOHC D-series cam gear I've seen. It gets lined up with the plastic pointer just under the cam gear, unlike the 1.5 liter marks. What picture? 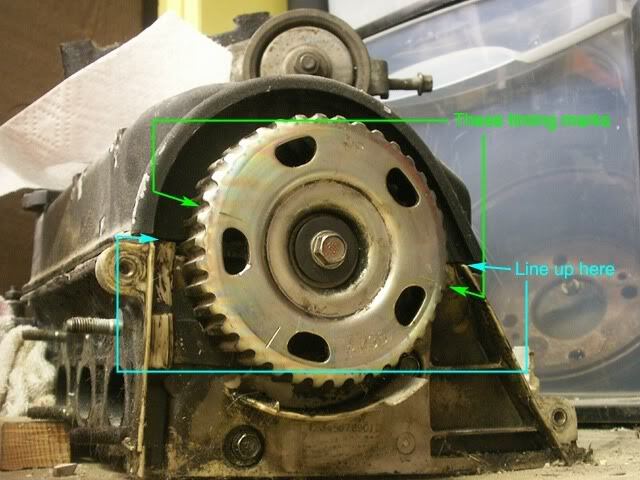 All the cam gear and crank pulley marks I highlighted in blue are marks you should ignore. The only important thing I marked in blue was the valve cover to head mating surface. [...] lined up with the bottom of the head. You mean the bottom of the valve cover? The bottom of the head is on the floor in the pic I posted this morning. The distributor rotor can only point one way. The distributor shaft is connected to the camshaft by an almost idiot-proof fitting... You can still take the fitting off the distributor shaft and put it on 180? out of phase. Loosening the bolts and moving the distributor housing back to the middle of it's adjustment range is probably a good idea, but I don't see how that relates to the no.1 spark plug wire or terminal. Sorry if I sound like an ***, I just hate to let bad or questionable information stand as truth. It gets lined up with the plastic pointer just under the cam gear, unlike the 1.5 liter marks. Okay, when I was attempting to set timing on the engine the only mark that would line up with anything was the 1.6 liter mark. I set the timing light full range from 0-60 degrees BTDC and no dice with the 1.5 liter marks and mating surface so the belt has to be off. Now to recap, #1 cylinder, the one closest to the timing belt and the one you put your timing light pickup on, has to be set to TDC by adjusting the crank pulley correct? Then separately, the cam has to line up with the deck between head and valve cover, then you put the belt on and keep this relation as close as possible... Then you time with the light using what marks? Your on course. When you get the marks lined up and the belt on, then you need to turn the crankshaft, to let the tensioner pull the timing belt tight. After you get the belt so it has tension, you need to tighten the tensioner bolt back down, to hold the tension. It is easy to have the tension on the belt not be as tight as it should because the piston and the camshaft have some pressure on them. If you turn the crankshaft counter clockwise, you can feel the tension in the timing belt by putting a finger on the belt, on the back side of the camshaft. Once the belt is tensioned, reposition the TDC and check for the alignment on the two marks on the camshaft pully, relative to the head. Yeah, their *green* not *blue*. The distributor is slotted, so you should not need to change it, you should be able to just adjust it to roughly the middle of it's travel, to start with. When you set the timing, on the crankshaft, you have the TDC mark, then about 1 1/2 inches away you have three marks close together. I don't know the exact number, but I usually set it to the middle mark, which is I think the 18 degrees it calls for. The other two marks are +/- 2 degrees, I believe. I believe I read that the HF is 12-16 BTDC... but things are starting to make more sense... what do the marks on the Crank align with when timing? I was attempting to time using the camshaft not the crank. Thanks everyone for the help so far! The timing marks on the crankshaft are measured relative to a plastic marker which is molded into the lower cover for the timing belt. If you look down an imaginary line drawn between the centers of the crankshaft and camshaft, the mark is about 3/4 of an inch towards the back of the car, behind that line. The mark on the timing cover is molded as a part of the plastic and it looks like more of a cast line, to me, than to a alignment mark, but heh, it is what it is. As far as the actual numbers of the marks, the middle one maybe 14 degrees then. One thing you might do is to get a bottle of white out and put a little white spot at each of the marks on the crankshaft. I always have a hard time seeing the marks on the crankshaft, using the light from the timing gun and it seems to help a lot to see them, if you have higher contrast. Woah, what are you using the timing light for? The cam and crank adjustments I described above are done with the engine off, no strobe light or anything. You only need a timing light for adjusting the ignition timing. We're talking about cam timing here. While you have the upper belt cover off, grab ahold of the crank pulley, or put a 17mm ratchet on it and turn the crank by hand (preferably counter-clockwise) until the cam gear marks are lined up. With the engine still off, look down the sight/pointer thing that you normally use for ignition timing. If the cam timing is correct, you will see the TDC mark on the crank pulley. If not, you need to adjust it. Go through the instructions I layed out before. Do not start the engine until you've gone through the whole proceedure. I'm pretty sure he was just giving some general advice on setting the timing after he'd finished. No need to jump down anyone's throat.